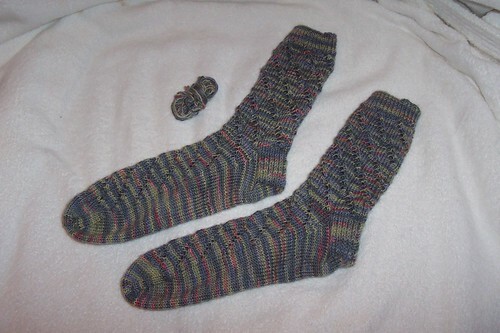 PIF socks, originally uploaded by lyndsey-jane. 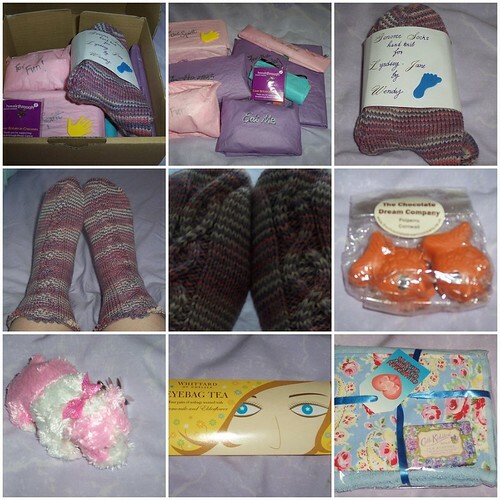 I joined Pay it Forward through Stariel and she sent me these gorgeous socks. They are knit with Yarn Pirate and I love them. 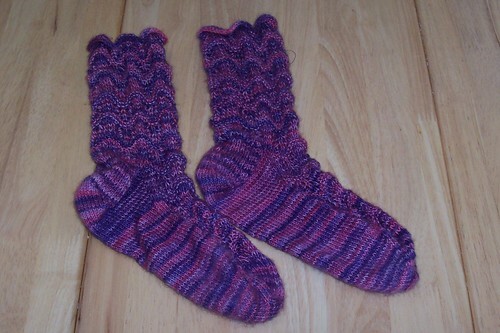 They are a perfect fit (even better than some I’ve knit myself) and are quickly becoming my ‘must wear’ socks. Included with the socks was a packet of Boston Baked Beans – sugar coated peanuts which reminded me of peanut m&ms without the chocolate. wip wednesday, originally uploaded by lyndsey-jane. The Sweet Pea socks are half done. They are really great knit i’ve just been lacking the sock mojo lately. They are for my Sock It To Me swap pal, so I had better get a move on. The Deep V Argyle Vest in just divine! Love the pattern, love the yarn, love the colours. I’m actually further along than this now. I have the waist decreases done and am about to start on the on the bust increases and in a few rounds time I have to place the neck steek stitches. We have decided on a winner for the Hamsters names, and will awarding a second prize also (this is a a name I really really liked but Karl wasn’t so keen on). We will be doing the draw for the random winner later tonight. I’ll try to post winners later tonight if not I promise they will be posted tomorrow. I been wanting to start selling my hand-dyed sock yarn for a while now and have had a great idea for a theme for an etsy.com shop which I hope is original and attractive. It is still very much in the planning stages (I need to persuade my Mum to lend me a small amount of money to purchase some blank sock yarn) but all going well I hope to have some ‘trial’ skeins up for sale in a couple of weeks – weather dependent. I would, however, like some input from all sock knitters. I would like to know what your prefered fiber content is when purchasing sock yarn. Please take a second to fill out the poll, if you choose ‘other’ can u leave a comment stating the content. Thank You! 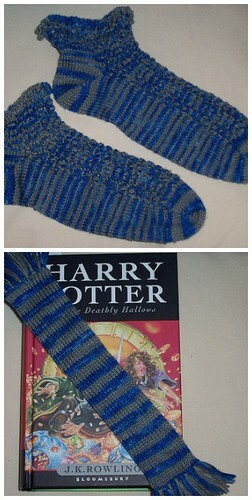 Hogwarts Sock Swap Socks, originally uploaded by lyndsey-jane. I finally finished the socks for my pal! A bit late but hopefully she won’t mind. I made a bookmark from some of the left over yarn – i think its pretty cool! 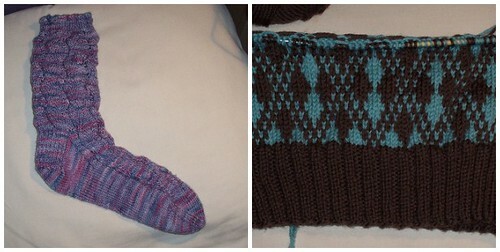 I’ve made a reasonable start on my sockapalooza socks (third time lucky). My pal as pretty narrow feet so I had to make sure I found a pattern that was suitable, i finally opted for Unst from Nancy Bush’s Knitting on the Road. I’ve turned the heel and am liking it a lot. I will post photos once I’ve decreased the gusset and it looks like more than just some random yarn on cocktail sticks. After completing my first of socks for summer of socks so quickly it then took me a while to get another fo, but this is pair two and pair three shouldn’t be too far behind. 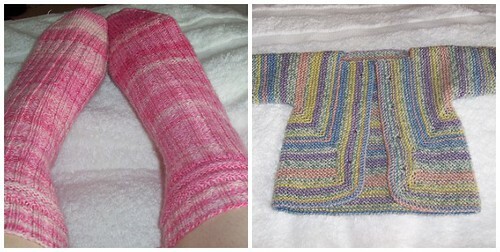 For all those on Ravelry have you joined the Sock Knitters Anonymous group yet? They are having year long knitalong with contest etc worth checking out. I’m not sure what to do next, read HP, listen to new Lime n Violet and knit or listen to my audiobook (The Rotter’s Club – great so far) and knit. Decisions, decisions.